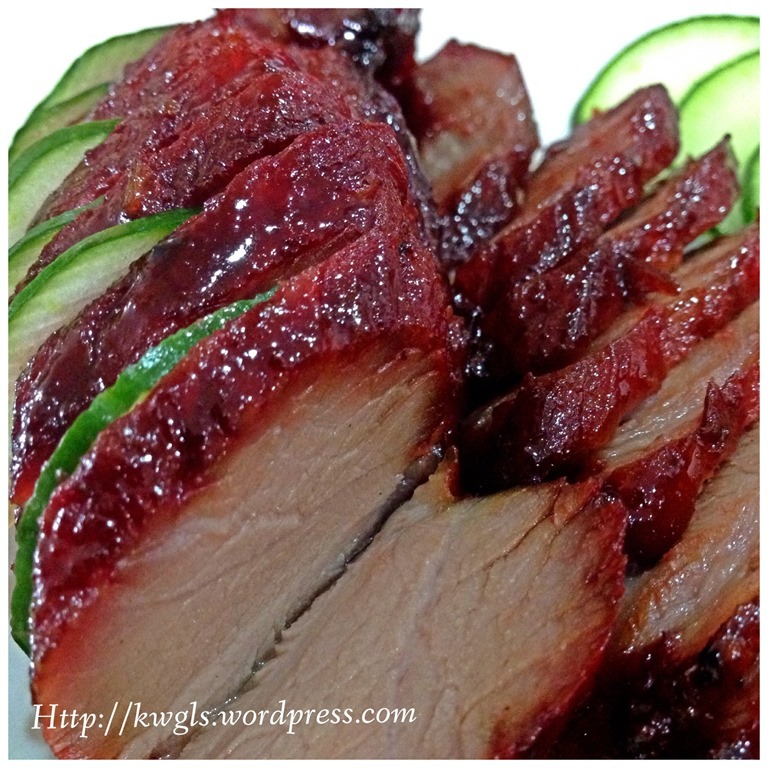 This post is concerning about CHAR SIU – CHINESE STYLE BARBECUE PORK (叉烧). 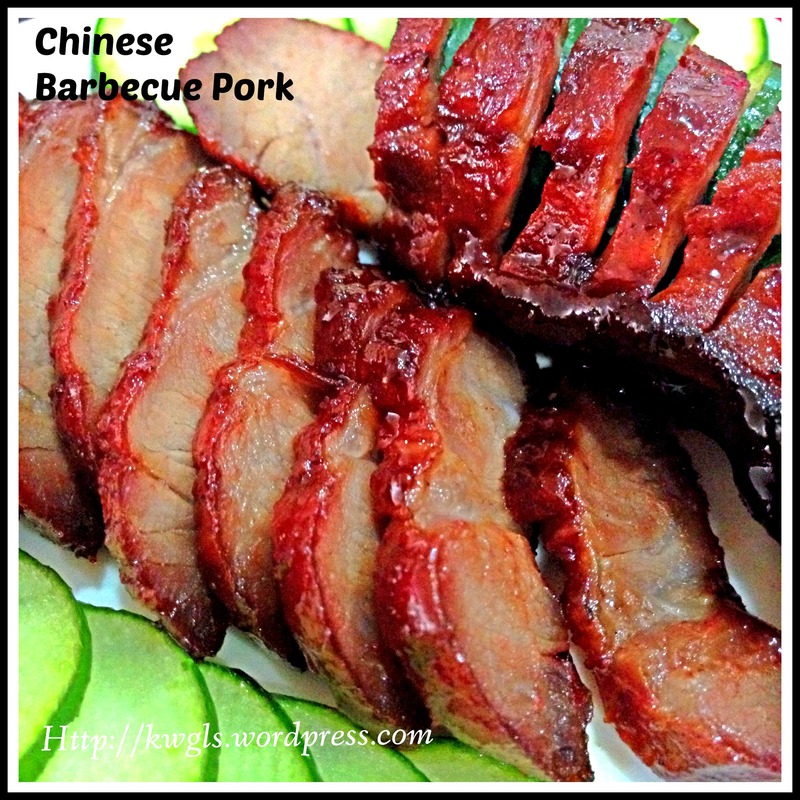 I doubt if there is any Chinese worldwide who have never tasted barbecue pork or Char Siu. I have eaten this as long as I can remember. 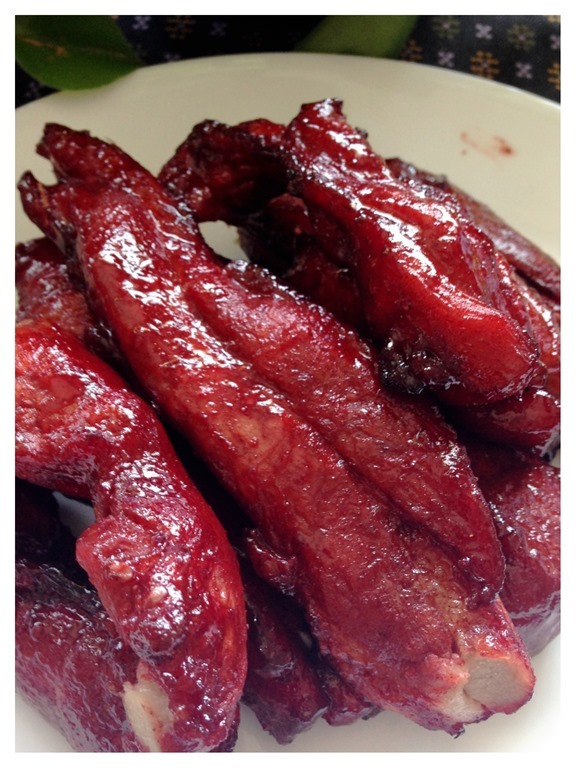 Whenever I went, I saw Char Siu being sold in local Chinese restaurants. When I was in Douala Cameroon, Africa, I can remember clearly that the Chinese restaurant in Douala is selling wonton noodles with Char Siu. 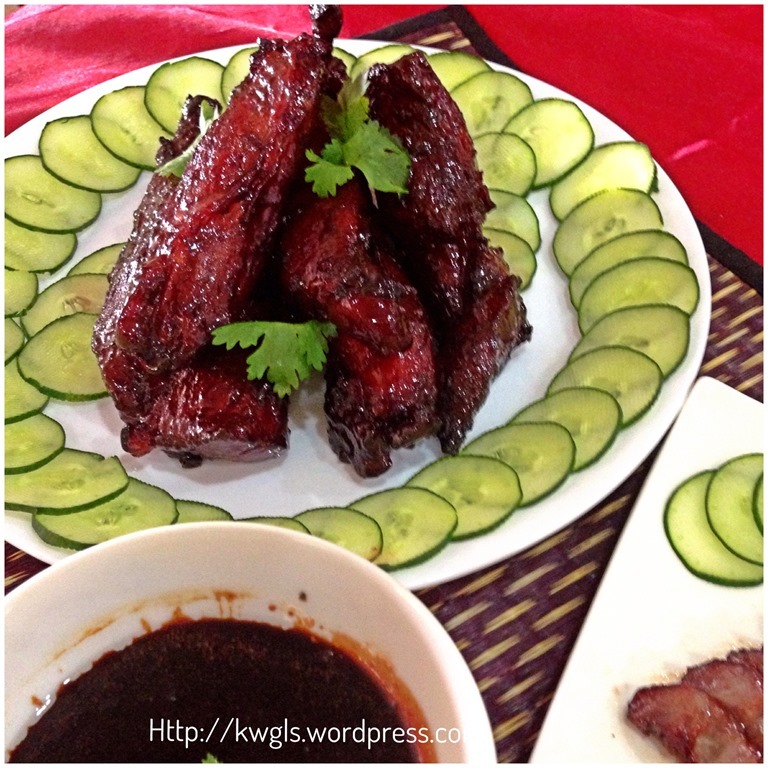 Even when I travelled to Siberian cities like Irkutsk, Krasnoyarsk, Khabarovsk, Char Siu is also one of the must have items in their Chinese restaurants. 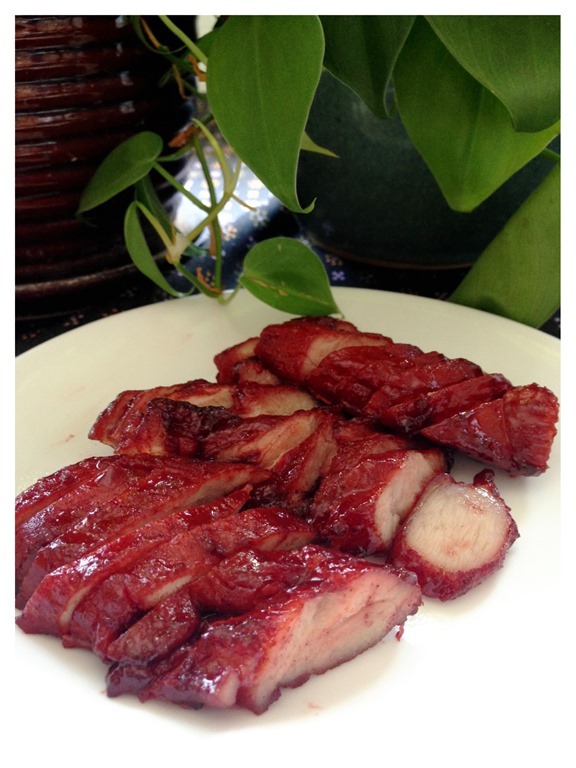 Most Char Siu overseas is the Cantonese version, which is sweet and slightly glossy. 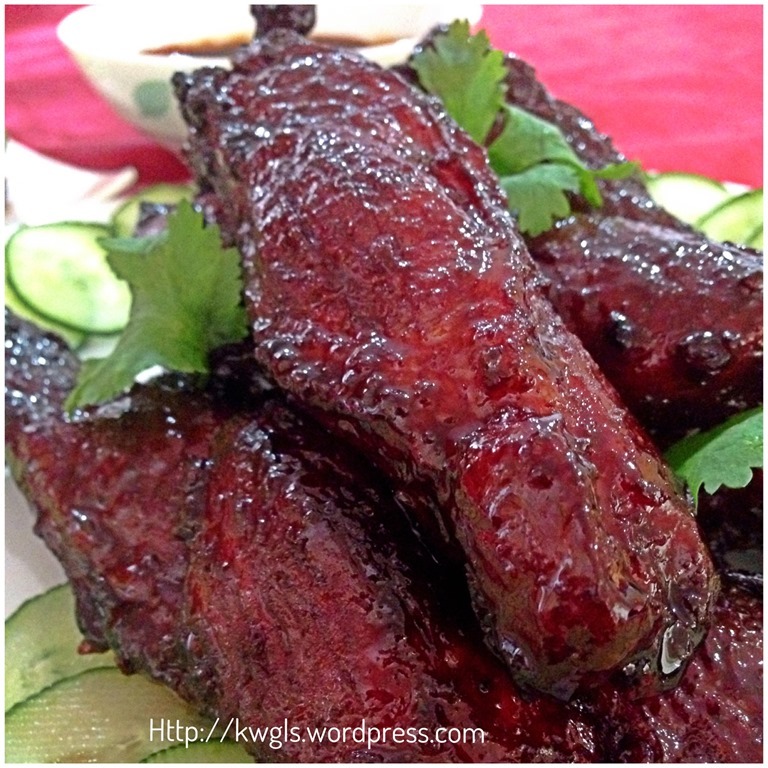 This type of Chinese barbecue pork had gain popularity and acceptance because of its sweet taste, nice fragrance and tender meat. 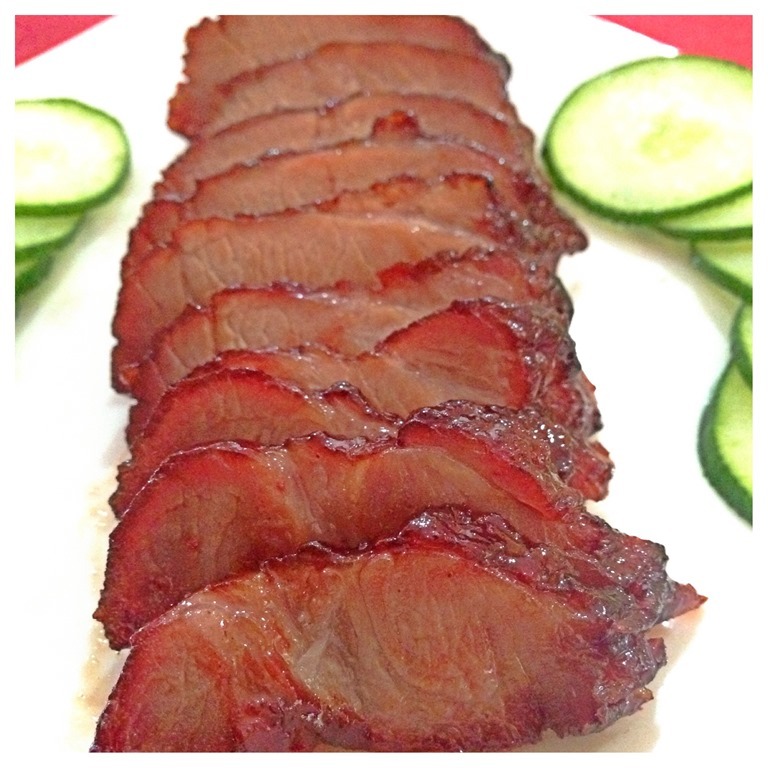 Char Siu is quite an international taste and can generally suit international foodies’ taste buds since it resembles honey roasted pork. It is another dish that I have prepared out of my cooking passion and own challenge. 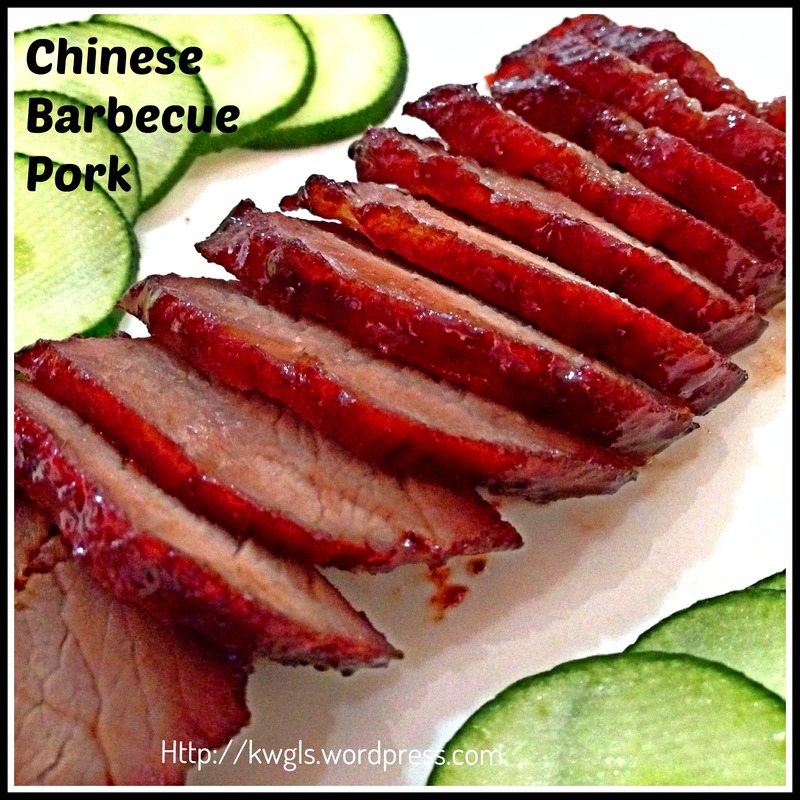 I have chosen the more commonly accepted Cantonese style of barbecue pork. 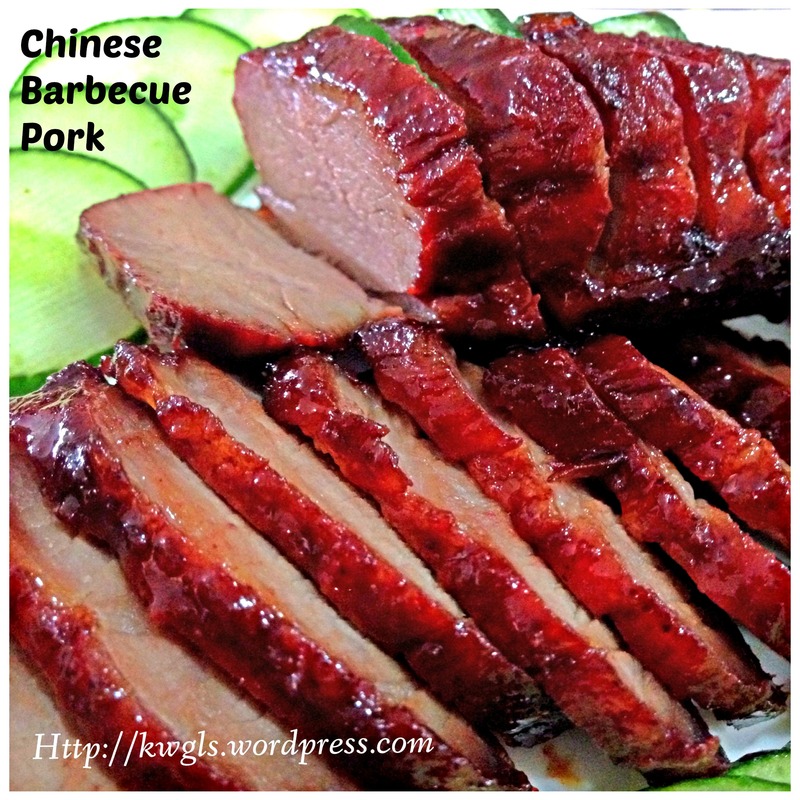 There are many, many, many recipes in the internet both in English and Chinese languages. Of course I am not capable to read every one of them, and this recipe is the first and only recipe that I read. I “digest” this blogger’s article (in Chinese) with great interest as she is very detailed in her approach. 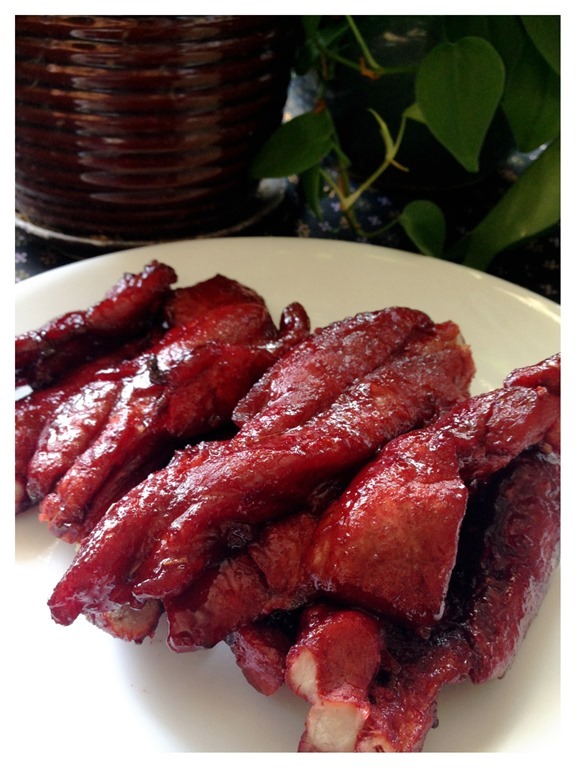 Though I have materially modified her recipe, I still want my readers who understand Chinese to read her article and credits have to go Jennifer, a Taiwanese whom in 2011 lives in San Diego. In her post 自己做….廣式蜜汁叉燒肉, she had a detail analysis in how she combined several recipes to come out with her own recipes. It is a rather long post but please take sometimes to read her post. From her post, I come out with my own recipe and modified my approach along the way. I think that the following 2 natural colouring agents deserves special mention in the post. One is red yeast rice wine (红糟酒）and the other red fermented bean curd (红腐乳）。Red yeast rice (红曲米）is also called koji in Japanese and is a bright reddish purple fermented rice, which acquires its colour from being cultivated with the mold Monascus purpureus. (Source: http://en.wikipedia.org/wiki/Red_yeast_rice). Red yeast rice wine is the glutinous rice wine made using red yeast rice. You can easily obtain red yeast rice in Chinese medical shops and as for red yeast rice wine, I got some from my neighbour. However, if you can’t obtain red yeast rice wine, you can substitute with normal Chinese cooking wine and red yeast rice residue (红糟）from the making of the wine. The red rice residue can be easily obtained from the supermarket under condiments sections. For more understanding on red yeast rice, please refer to HERE. 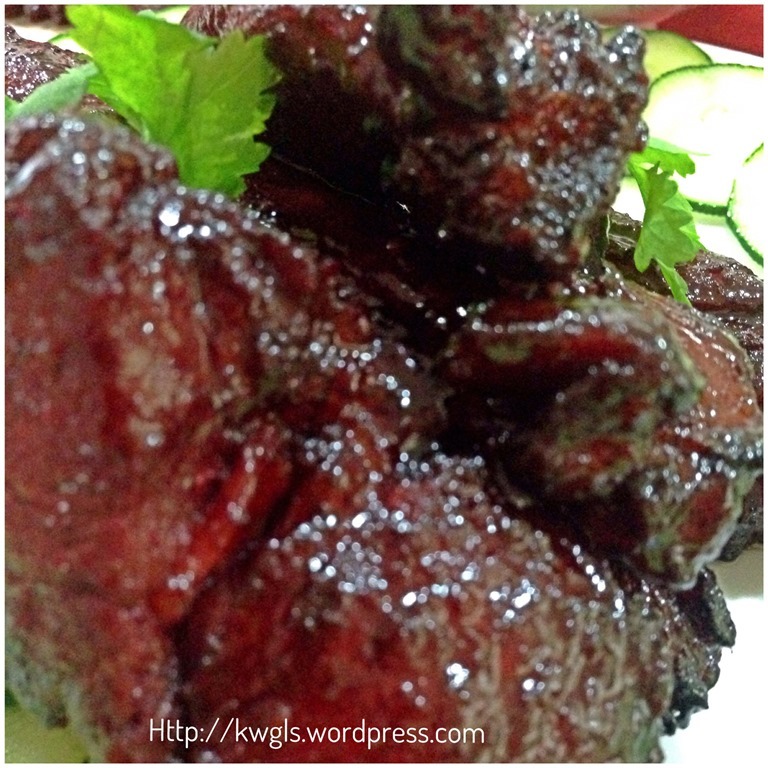 Red fermented bean curd is a type of Chinese fermented bean curds and coloured using red yeast rice above. 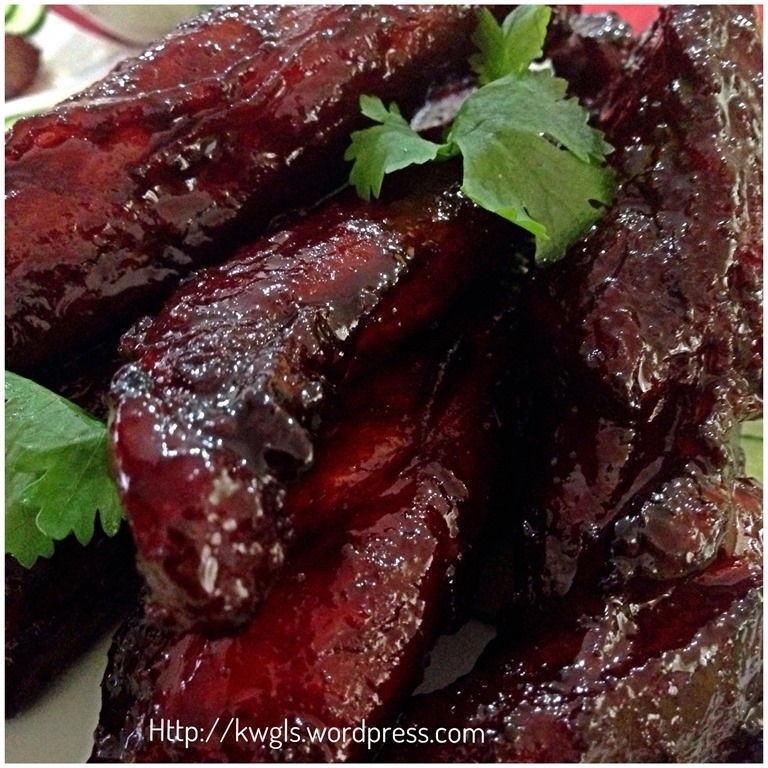 It is used in a number of Chinese cuisines or it can be eaten with porridge. It is salty and can be easily bought in Chinese provision shops or supermarkets. However, both these ingredients are optional. 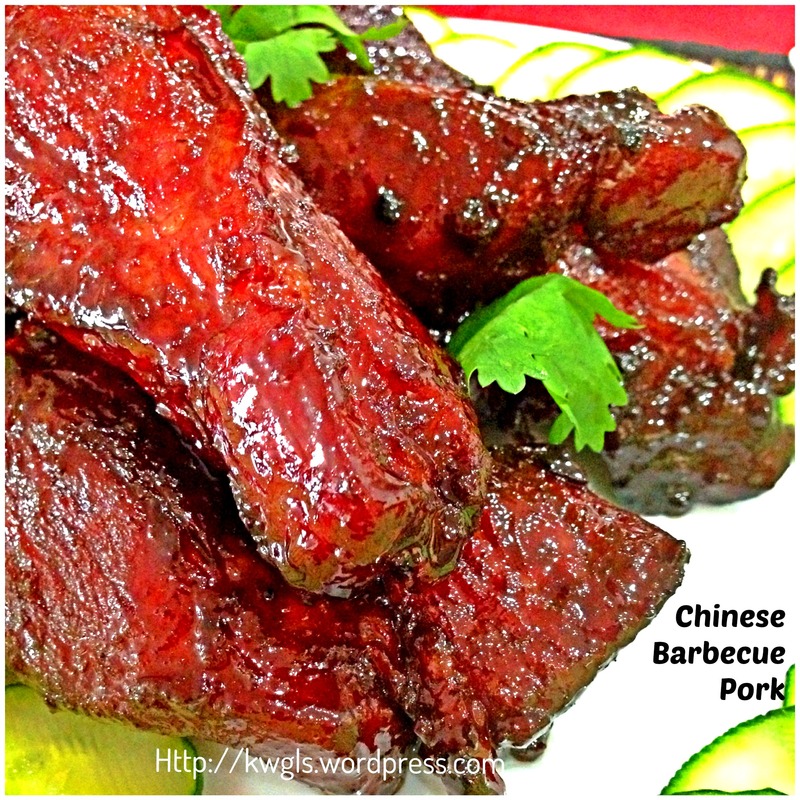 If you do not want your barbecue pork to have reddish colour, you can just straight away substitute the red yeast rice wine with normal Chinese cooking wine and the red fermented bean curd with cream coloured fermented bean curd. 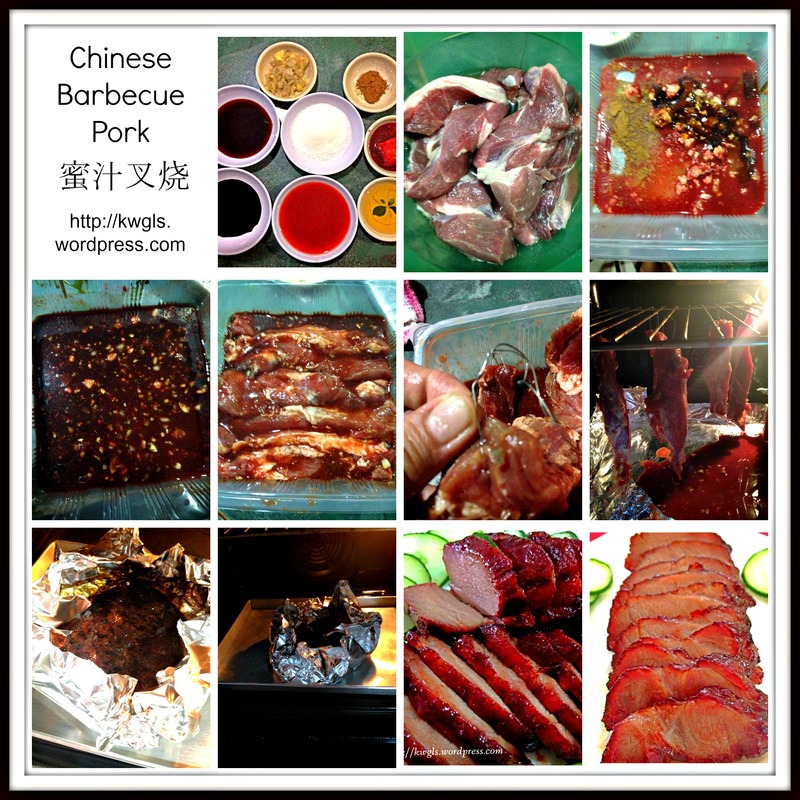 Note: For the meat, you can ask the butcher to cut for you and even ask them to recommend the best type of meat for the preparation of barbecue pork. They will be able to offer good advises. Pour all Ingredients A into a big plastic box. Stir well and ensure that all the pork were coated with the sauce. Marinate for at least 1-3 days in the refrigerator. For this illustration, I have marinated for about 2 days. Arrange the wire rack of the oven to sit at the highest level of the oven possible. Put a big piece of aluminium foil on top of the baking tray and put it at the lowest level of the oven. Preheat the oven to 180 degree Celsius. 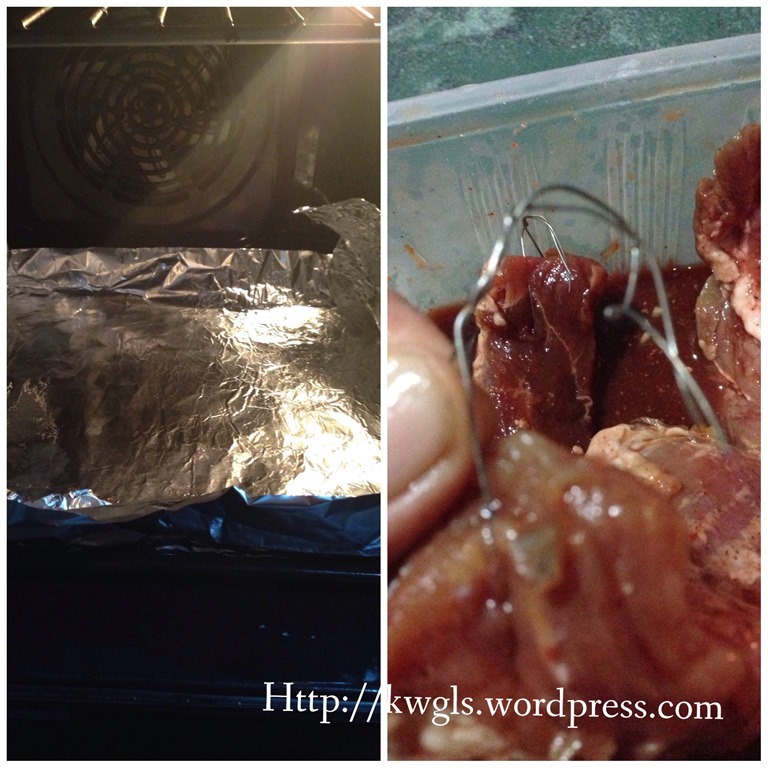 Wash the wire with clean water and pierce the wire into the marinated meat and making it into a S hooked shape. Mix all Ingredients B together and set aside. BE CAREFUL NOT THE TOUCH THE OVEN RACK AS IT IS HOT. Hang your meat in the oven rack and grilled for 15 minutes. 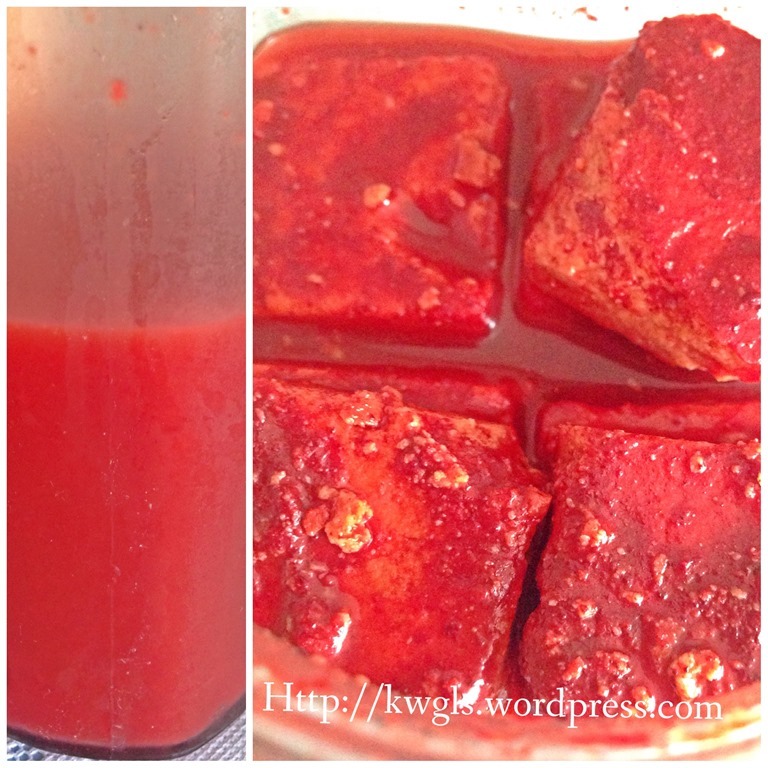 You may have some marinating sauces left in the plastic box, add it to Ingredients B above. 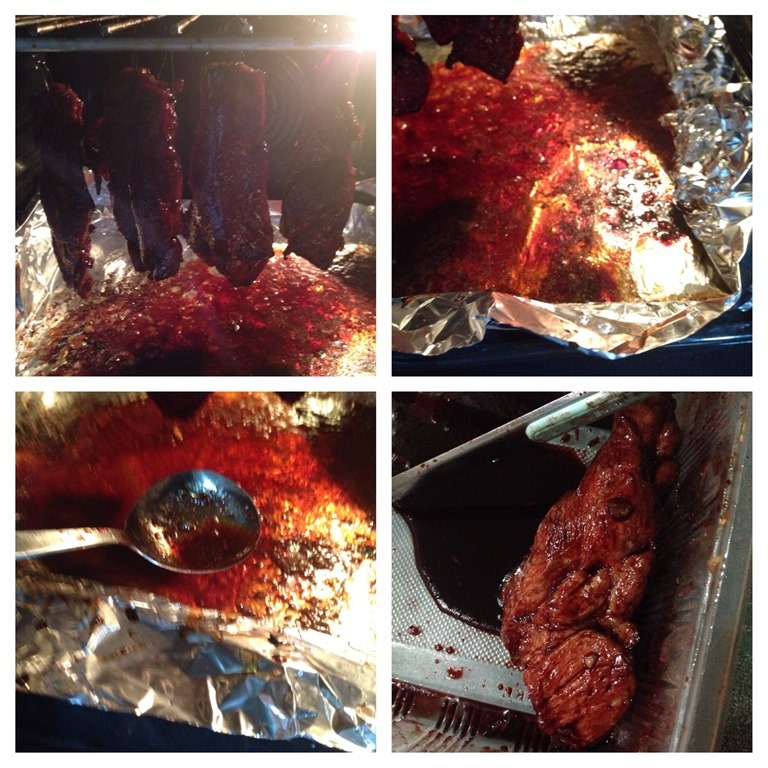 In the grilling, you will witness the meat juices and some marinating sauces start to drip down to the aluminium foil. If you want, you can scoop out the meat juices or sauces and put it together with ingredients B. If you note that some of meat juices or sauces in the aluminium foil start to get burnt, add some water to the aluminium foil. 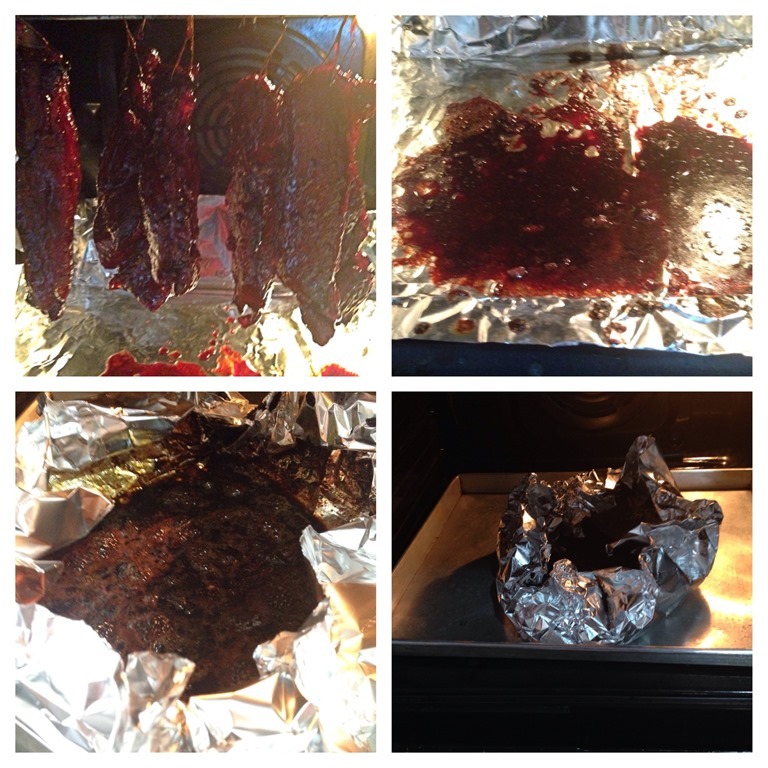 After 15 minutes, open the oven door and take out the meat and it is okay if the colour of the meat is very faint. Coat the meat thoroughly with Ingredient B sauces. Hang it back in the oven rack (BE CAREFUL!). Do the same for all the meat strips. Grilled for another 5 minutes and repeat the same at the interval of 5 minutes until all the sauces are used. I have repeated 3-4 cycles and you will gradually see the meat glossier and glossier. 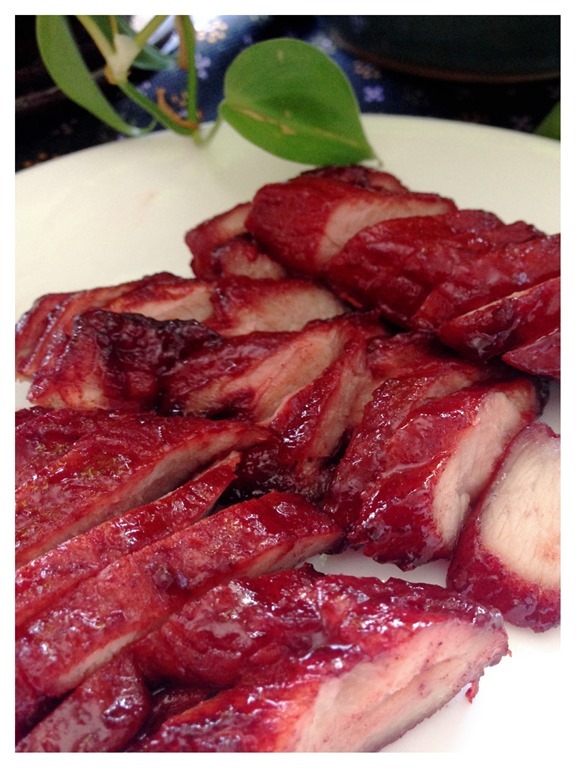 For the last cycle, let it grilled for 10 minutes before taking the barbecue pork out of the oven. 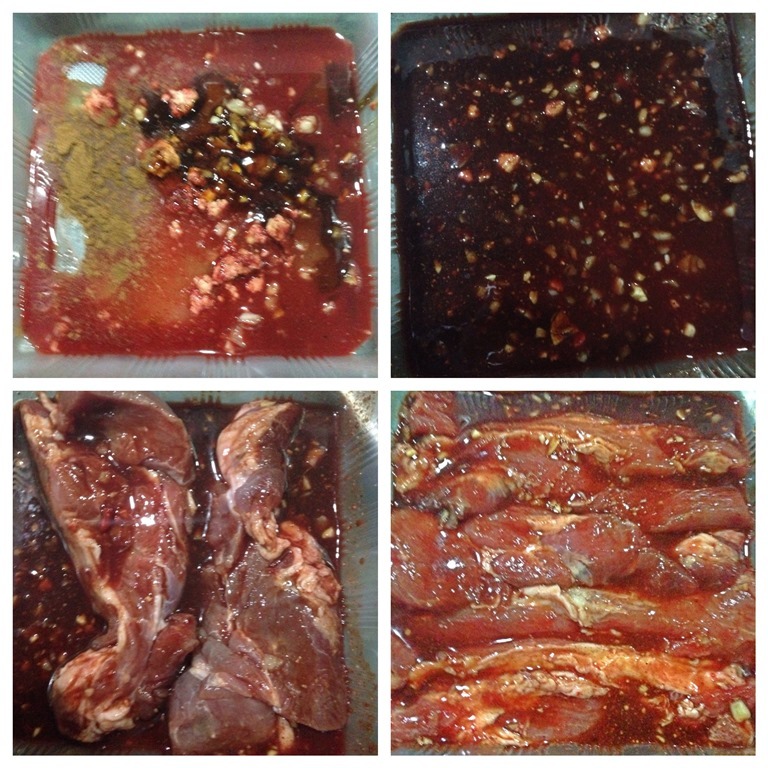 After you take out the meat, you may have a lot of sauces of meat juices in the aluminium foil. Slight shape the aluminium foil to reduce the surface area and continue grilling until the barbecue sauce thickens. Once you see lots of bubbles in the aluminium foil, it means that sugar has started to caramelize and barbecue sauce is almost done. Once done, take it out and pour on the serving bowl for later dipping. It took me about 2-3 minutes to thicken the meat juices and sauces. 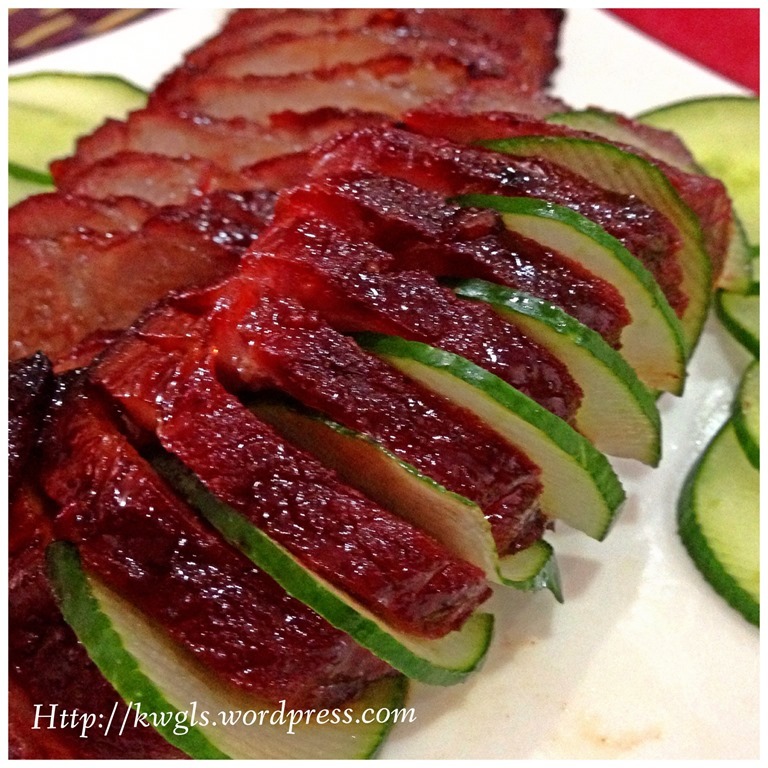 Cut into slices and can be served with wanton noodles, white rice, porridges or as a meat dish on its own. Making this is not really difficult but slightly laborious. Via this exercise, I found that the final part of re-coating with the sauces is the most important. After 15 minutes, the meat is almost cooked. The final exercise is to “cosmetically decorated” the meat before serving. 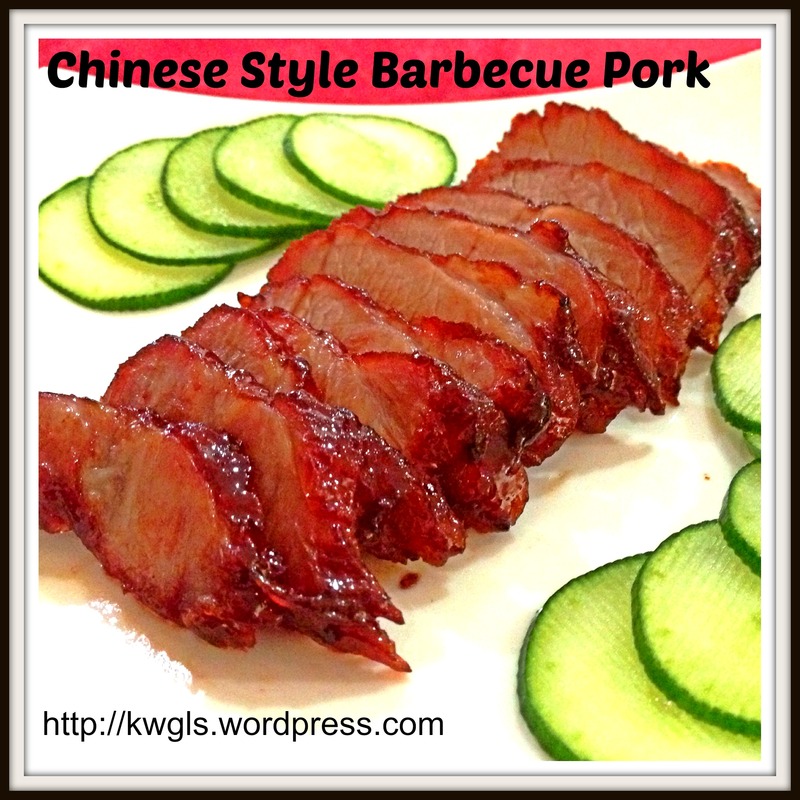 Via this way of preparation, your barbecue pork with be glossy and juicy. Depending on your preference, the type of meat is of prime importance. I have to admit that I do not really know which part of meat I have bought. I am telling the butcher that I want to make barbecue pork and he gave me these meats. “Post mortem” showed that it was slightly lean and not as juicy as in the restaurant. Obviously, it was due to the wrong type of meats used. Therefore, butchers right recommendation is very important. I have to say that the taste of the meat is much better than what I have expected. Forgive me if I am not humble enough to say that it was like what I usually purchased in the stores. 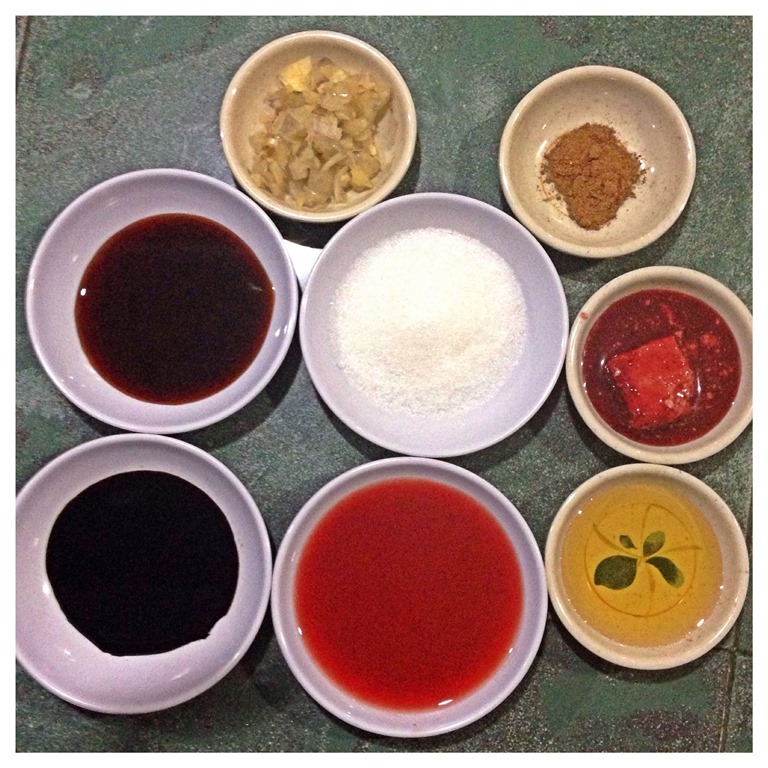 Though there are many sauces and seasonings used, however, I am of the opinion that the most important ingredients are garlic, red fermented bean curd sauces, dark soya sauce and most important of all sugar or honey. Meat has its own flavour and even if your marinating is not long enough, you can still make good the taste at the last 15 minutes of grilling. I have prepared some barbecue pork today. Since I cannot get hold of the red glutinous rice wine and do not have red fermented bean curd with me, I have substitute with red yeast rice powder. Red yeast rice powder (红曲粉） can be easily obtained in Singapore bakeries. 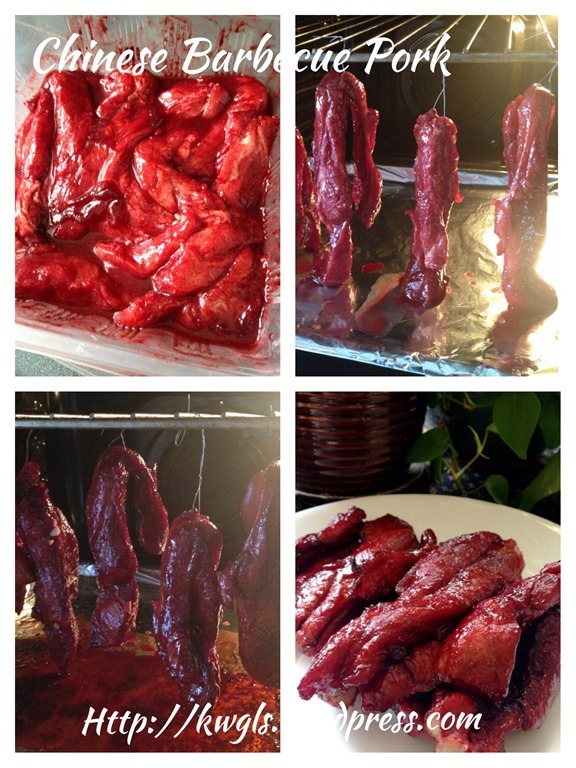 Just sharing some photo for this batch of Char Siu. 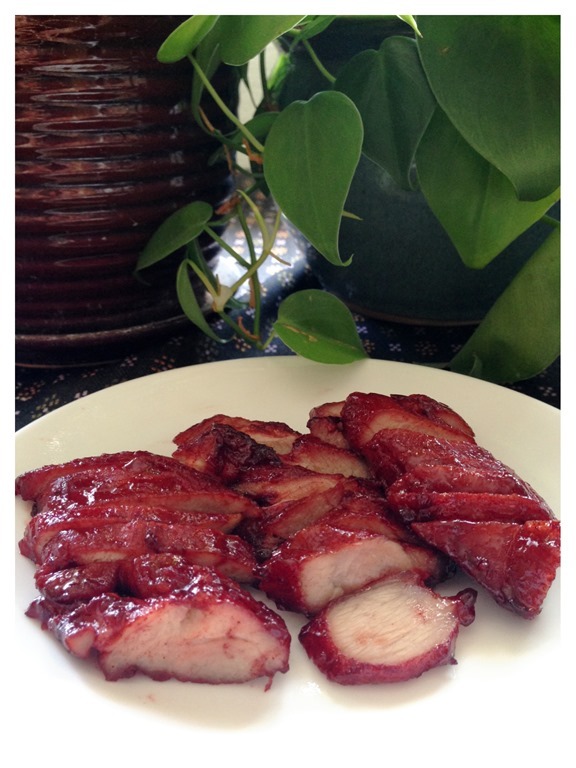 Plan to use these char siu to prepared some barbecue buns etc.. 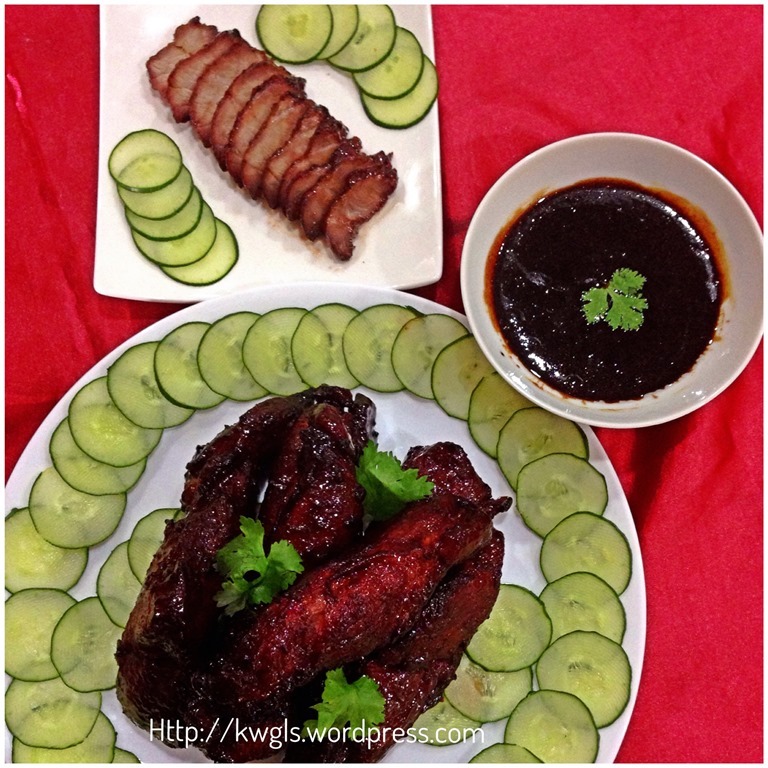 This entry was posted in Dish, Food Preparation Series, Meat Dishes and tagged 8, char siu, CHINESE, chinese barbecue pork, home cooked foods, Home cooked meals, malayisan, POST, singapore, 叉烧，蜜汁叉烧，pork， 红糟，红腐乳，红糟酒，红曲， chinese dish. Bookmark the permalink. Wow! this looks like hard work and looks really tasty. If I could reach out in my computer and get some I would. I am literally drooling. Fantastic pictures, looks so succulent and tasty! Thanks for linking up to #tastytuesdays again! Fabulous having you! I just booked marked this recipe and will be doing it for some friends. 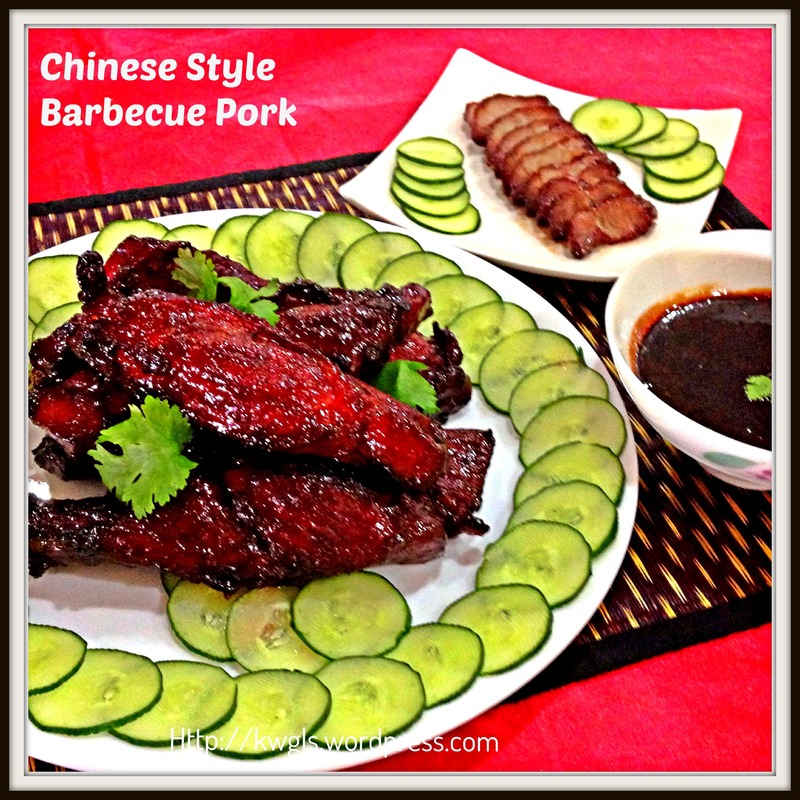 I so excited because I have always loved this BBQ at Chinese restaurants. Thank you for sharing it on our Four Seasons Blog Hop. I look forward to more recipes. Thanks. Will do the same. This is great love it, pinning to my everything yummy board. It is nice to see male bloggers, thanks for sharing on Real Food Fridays, please join us again. This is GORGEOUS, Kenneth! Thankfully we have loads of amazing Chinese restaurants in San Francisco because I would never manage to make this on my own. I’m very impressed, and thank you for sharing it at Saturday Night Fever! Kenneth, I’m not sure which is better, the recipe or the photos! Great job! One question, what cut of pork do you use for this? I’ve been trying my hand with some Asian cuisine and would love to give it a try. G’day and looks delicious Kenneth, true! Your photos are great! 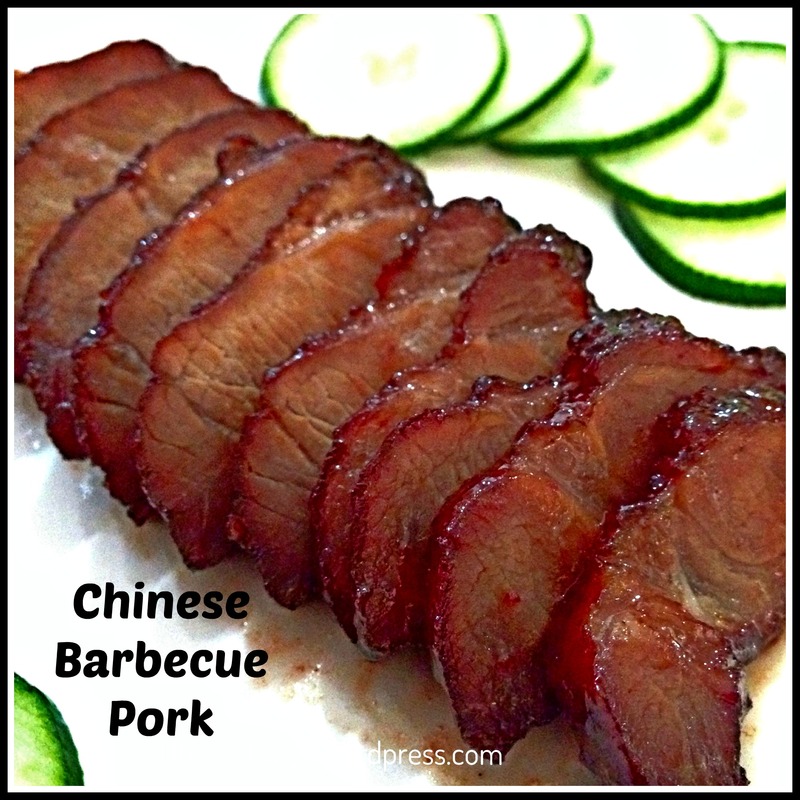 I have made Chinese Style Barbecue Pork–Char Siu ; your recipes looks unique! The glaze on your meat is so appetizing. Thank you so much for sharing this dish with us on Food of the World.